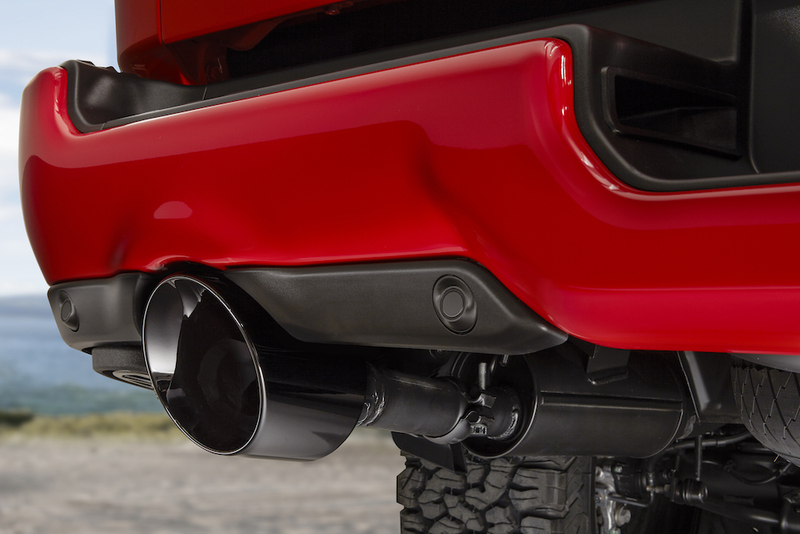 The all-new 2019 Ram 1500 was unveiled at last month's North American International Auto Show in Detroit, and we knew it was only a matter of time until the folks at Mopar came out with some sweet accessories for their new baby. Of course, that appropriate time was this at this week's Chicago Auto Show, which is commonly referred to as the nation's truck and SUV show. In an attempt to surprise the media, Ram placed a massive black sheet over the outfitted pickup, because nobody would ever guess what was underneath. After a short introduction, the wraps were pulled off the tank-sized "secret" object and exposed an outdoor-sport-themed 2019 Ram 1500 modified with, you guessed it, all-new Mopar accessories. After digesting the fact that a black sheet the size of a small house actually exists, I zeroed in on the larger-than-life Ram truck that sat before my eyes. 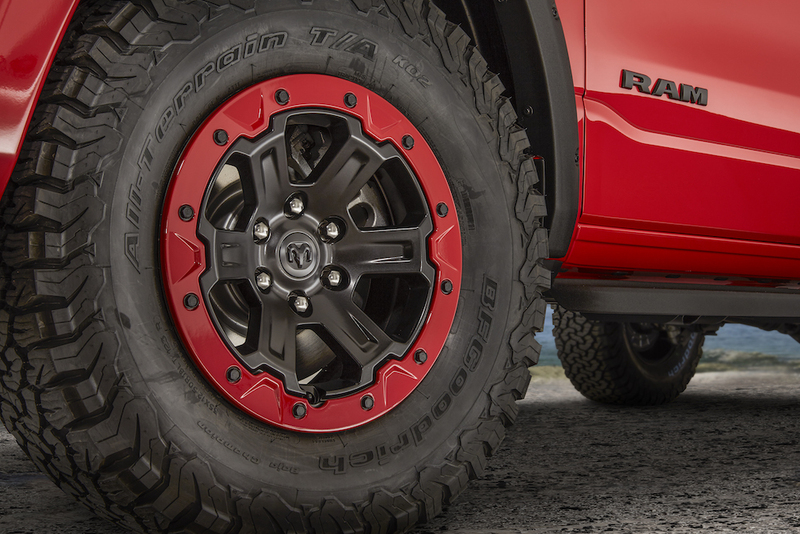 Finished in a bright shade of red, the Mopar-ized 2019 Ram 1500 Big Horn Sport 4x4 featured a 2-inch lift kit, 35-inch off-road tires, and 18-inch beadlock-capable wheels with matching trim rings. But wait, there's more! 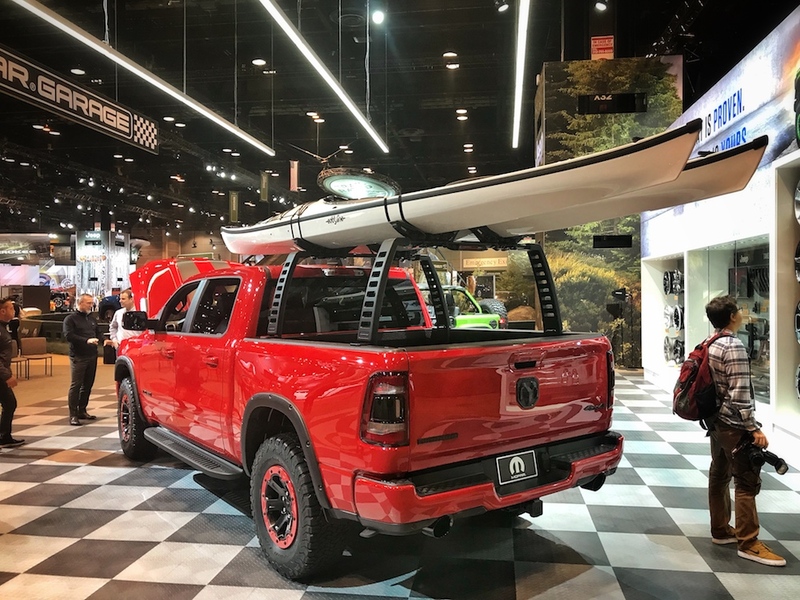 A lifestyle "Ram Rack" supporting two massive kayaks had been affixed to the bed of the truck. 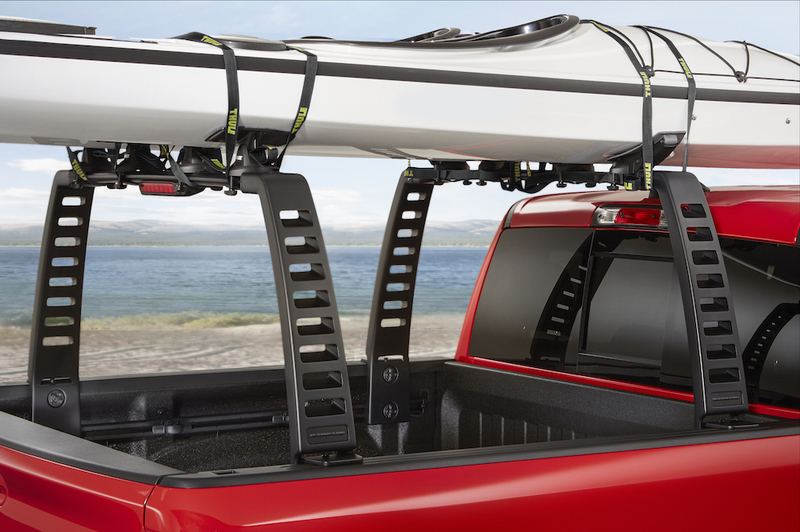 The clever accessory is similar to utility racks often seen on modern SUVs, but it's designed to fit over a truck's bed without compromising cargo capacity. Other less in-your-face Mopar accessories included off-road fender flares, cast aluminum running boards with skid-resistant stepping surfaces for better grip in muddy or wet conditions, hood graphics, blacked-out Ram badges, and front tow hooks. Performance accessories included a five-inch dual-tip exhaust system and a new Mopar “Ram Airflow” cold-air intake that provides a steady flow of fresh air to the 395-horsepower, 5.7-liter Hemi V-8 engine. All in all, Ram focused on making its truck perform as good as it looks. While this may sound over the top, it's important to remember that automotive aftermarket products are part of a multi-billion-dollar industry. Ram, along with other automakers, is aware of this and are constantly working to get a bigger share of these aftermarket dollars, something which has become more evident at the yearly SEMA show. "Our portfolio of accessories and performance parts was created by the designers and engineers that developed the truck, which means they offer a perfect fit and finish that's second to none." Gorlier continued, "Another key difference is that our accessories are installed by our custom shops within the manufacturing plants, which mean's they're warrantied and incorporated to the window sticker, and therefore can be financed with the vehicle's purchase." The 2019 Ram 1500 is expected to go on sale during the first quarter of 2018.